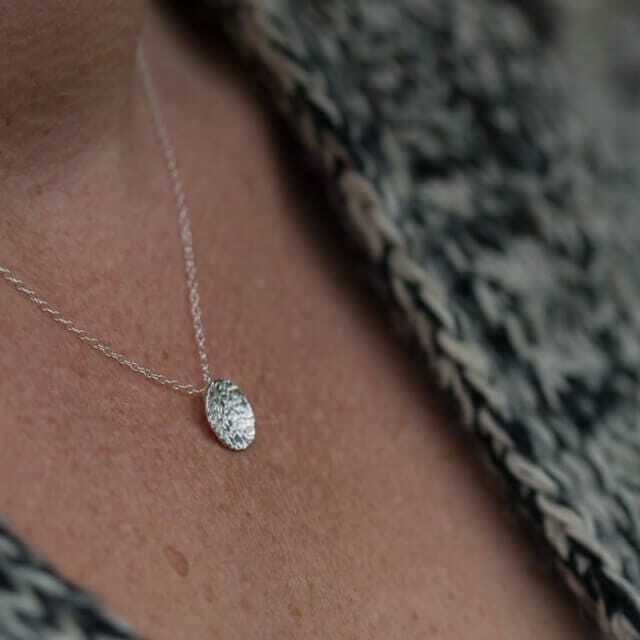 Sterling silver small lichen pendant, matches the lichen studs. Available in white or oxidised silver finish. 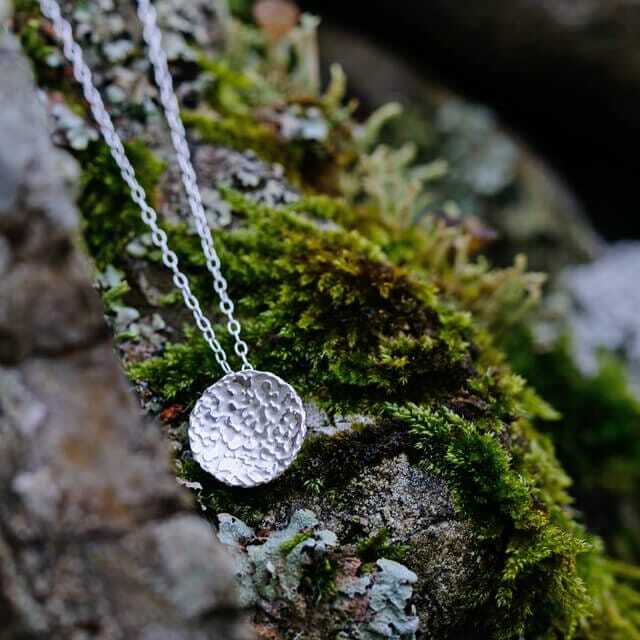 Taking inspiration from the patterns created by lichen growth, the texture is created by acid etching onto silver. The pieces in this collection use depletion and oxidation to create subtle differences in colour. Settings with faceted stones are reminiscent of the jewelled stalks of soldier lichen. I appreciate lichens qualities; seeming fragile yet strong, being tenacious, adapting to its environment, being understated, not showy or flashy, but beautiful all the same. This collection has been one of my best sellers, beautiful pieces that are easy to wear, original, contemporary, understated and elegant. I'm a jewellery designer living in the beautiful Eskdale valley of South West Scotland and working from my studio in our gallery Cut the Mustard. I'm really lucky to live in this area, a simple drive home from work can be like an episode of spring watch, this area teems with wildlife and nature. I'm surrounded by hills and forests, rivers, iron age hill forts and stone circles. I take inspiration from nature unsurprisingly (it's hard not to!). The more time I can spend outside, the happier I am. I like to feel the seasons, the rain on my face, the frost under my feet (not so keen on feeling the midges in summer though! ), the smell of the soil after the rain and the changing colours of the landscape. I appreciate the quiet and the dark skies at night, untainted by noise and streetlights. My pieces are subtle and elegant, original and beautifully finished. I create in the traditional way, using hand tools and small batch production. It's really important to me that I create by hand and I really enjoy working in this way, I like the process, the melting, milling and forming and the technical challenges. My pieces are often textured and most likely are set with stones (creating mounts and setting stones are my area of interest). I am a member of the National Association of Jewellers, of Spring Fling/Upland and the recipient of two craft maker awards and a regional arts fund award. I work in silver, gold, palladium and platinum. I sell my work through exhibitions and a selection of lovely galleries in the uk. I'm more than happy to undertake commissions. Living where I do, I'm surrounded by trees and drystone walls. Lichen grows on any surface it can and it's an amazing thing. It clings to any surface or crevice with amazing tenacity, not only growing but thriving in what are sometimes the most inhospitable places on the planet. Did you know that lichen is not one but two organisms? It can live alone, but prefers to create a symbiotic relationship, in order to thrive, much as people do and it comes in so many different shapes and forms, all beautiful, some almost flat, some appearing like ruffled collars, some like jewelled stalks. All looking fragile and all very strong and persistent. This is what inspired my lichen collection. 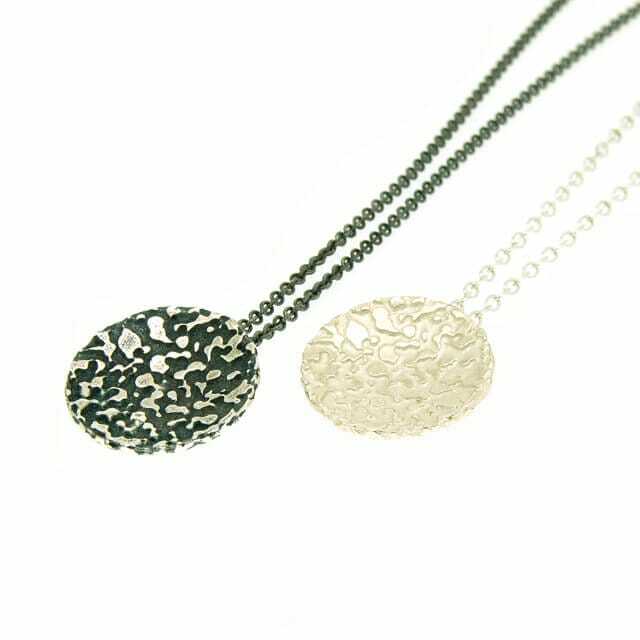 I take inspiration from the patterns created by lichen growth, acid etching onto silver to create texture, using depletion and oxidation to create subtle differences in colour. Altering length of immersion and temperature to create differences in depth of etch and setting with faceted stones, reminiscent of the jewelled stalks of soldier lichen. I appreciate lichens qualities; seeming fragile yet being strong, being tenacious, adapting to its environment, being understated, not showy or flashy, but beautiful all the same.